So apparently I celebrated the momentous occasion of Miranda Mercury’s release by spending a ton of money on any and all things cool. So much in fact that for the first time in several San Diego trips, I actually had to mail some of my stuff home early so as not to explode my suitcases, even though I brought an extra one along specifically for this all-important task. 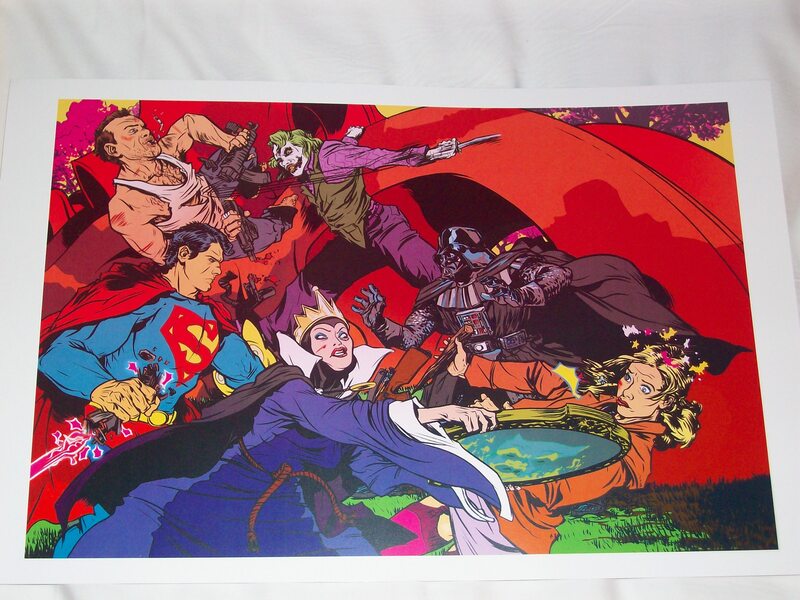 And it wasn’t just books, mind you…it was also exclusive prints, posters, etc. 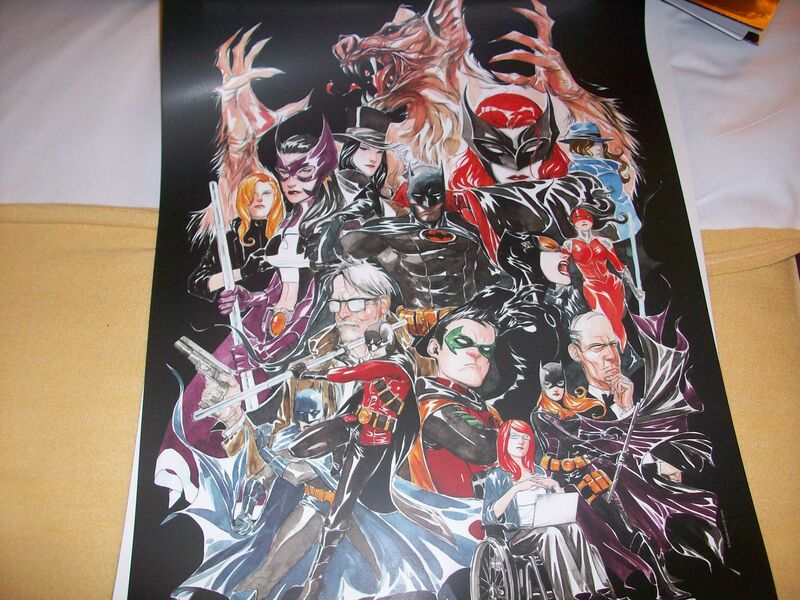 that led to me picking up a poster tube and a protective sleeve. But there are great, beautiful things filling both items now and that’s all that really matters in the end, right? Things started almost immediately on Preview Night right after my signing was over and I was walking the show floor for the first time. 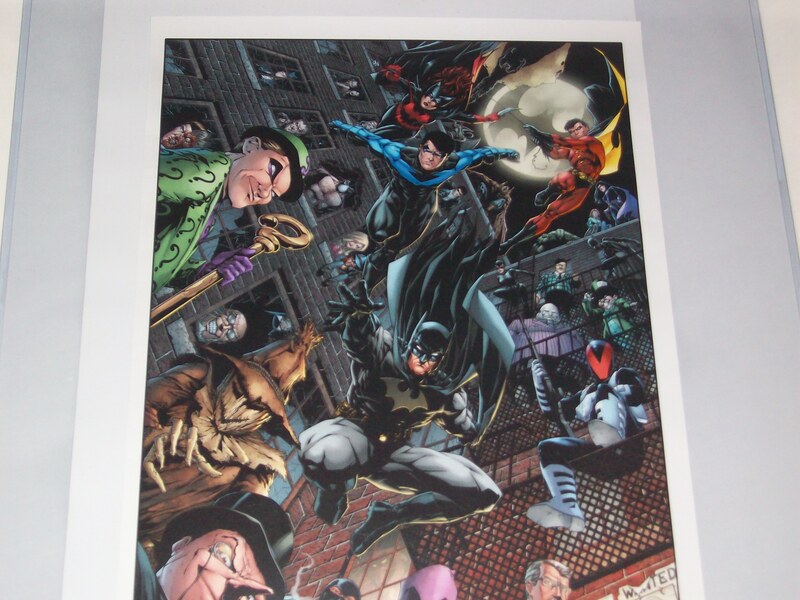 Before long, I was in Artist’s Alley, and not long after that at the table of Nathan Fox, who is a tremendous artist, who also happens to be coming onboard Image’s Haunt series alongside writer and Man of Action, Joe Casey. First discovered Nathan’s stuff through the Dark Reign: Zodiac mini he and Joe did awhile back and I was an instant convert. 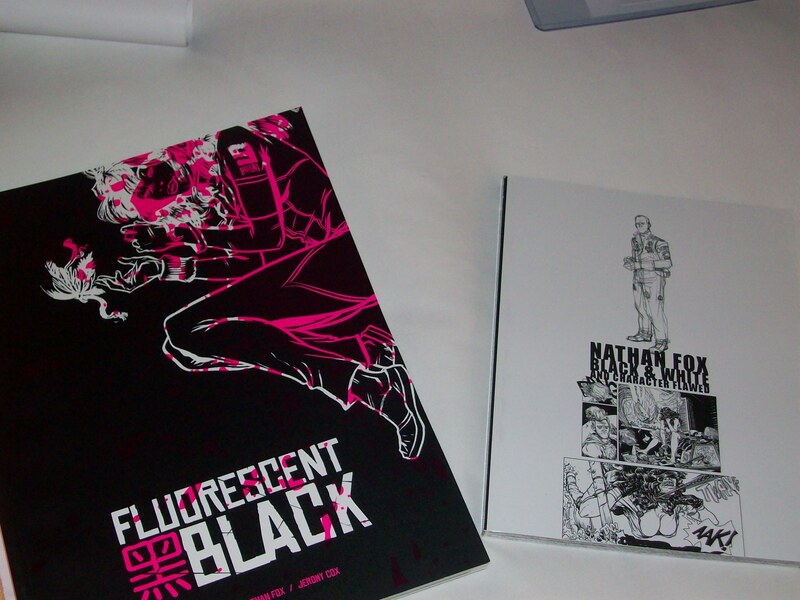 Unfortunately, a couple conventions ago (might’ve been a Wizard Chicago) I had to leave his beautiful “Nathan Fox: Black & White and Character Flawed” sketchbook behind because of lack of money, even though at 20 bucks it was clearly the deal of the show. So I corrected that terrible oversight on this Preview Night and also picked up his glorious and massive new book (I think) Florescent Black. For good measure, and so he wouldn’t have to give me any change back (which is my story and I’m sticking to it) I bought a couple of his prints, which were priced to move at only five bucks. So got something of a fast start to the weekend and it would only get worse (or better) from there. 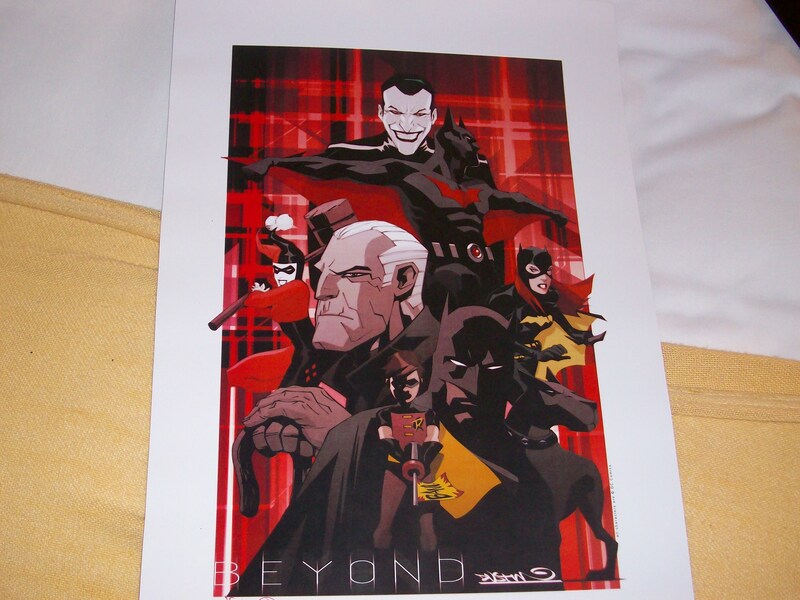 Thursday I got hit up big time by Dustin Nguyen, who first snared me with a fantastic Batman Beyond: Return of the Joker print, which I thought was a fair compromise, as I really wanted one of the larger prints of the Batman family of heroes and villains. 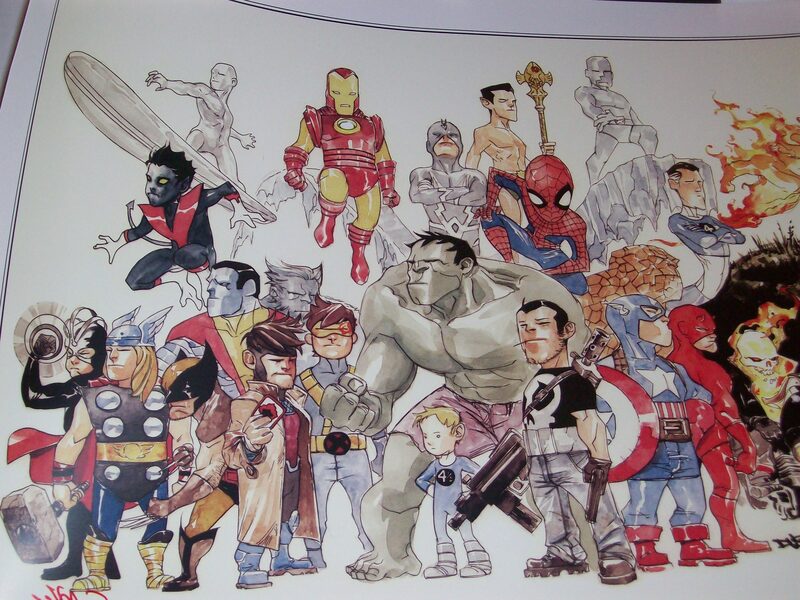 Walked away perfectly happy about my choice, but not even an hour later I was back for the Batman piece and this really cool Mini/Baby Marvels print. 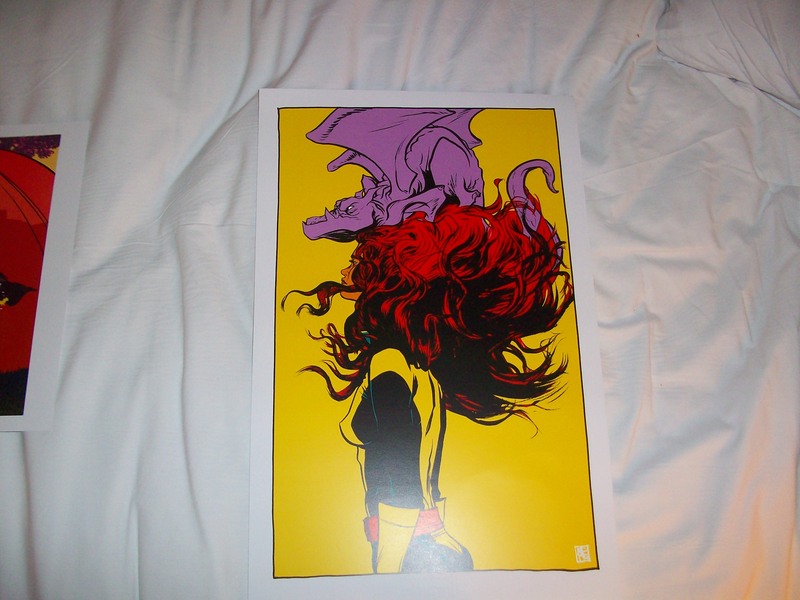 And because I got two prints from him, I got his newest sketchbook completely free for my troubles. 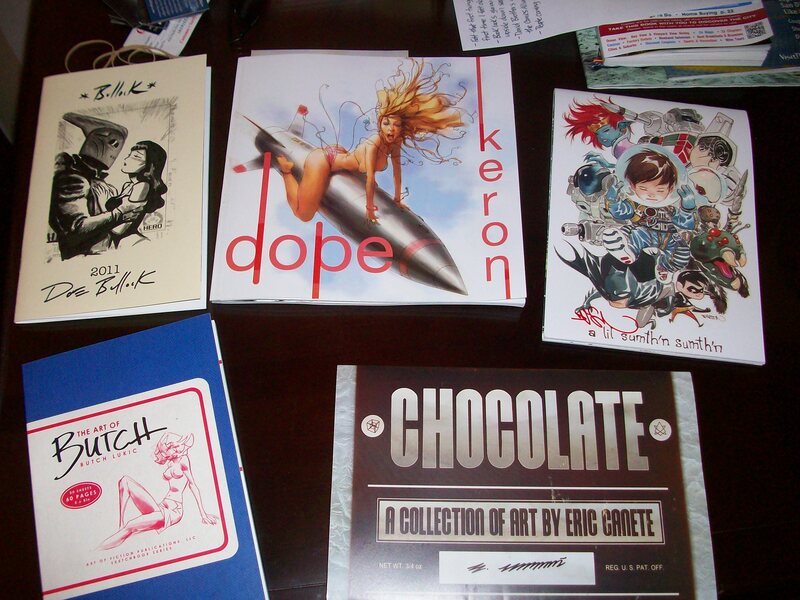 Also picked up awesome sketchbooks from Keron Grant (DOPE), Eric Canete (Chocolate), Dave Bullock and Butch Lukic. 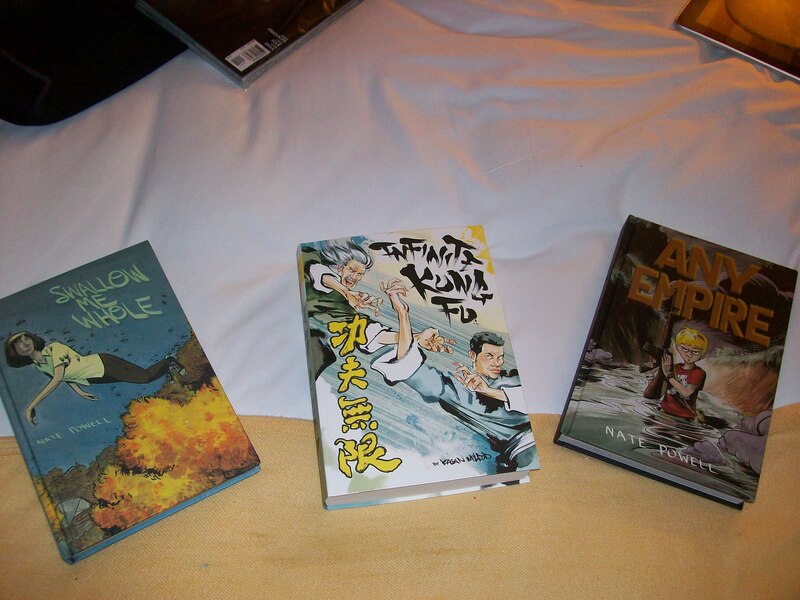 Those last two sketchbooks came from an exhibitor named Stuart Ng Books, whose booth was also packed with beautiful French albums and rare art books from and about dozens of creators. 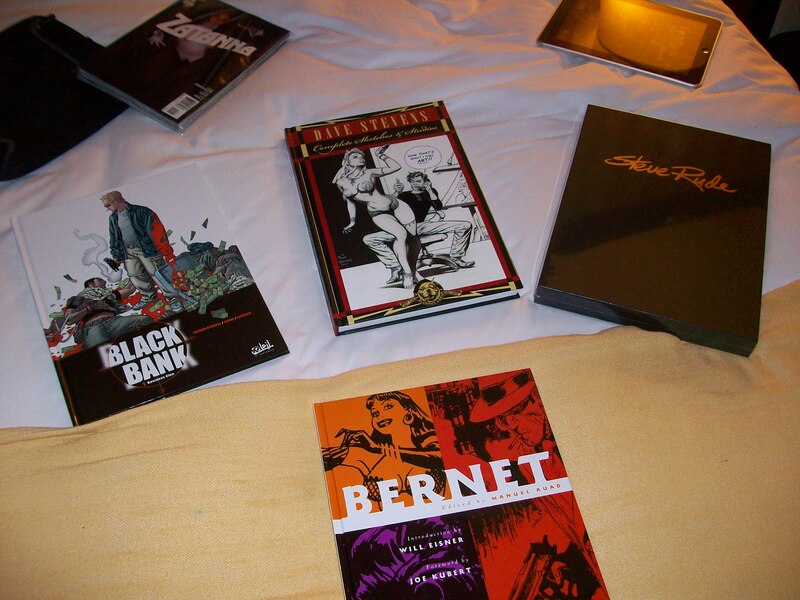 Since I’m always trying to improve my collection on that front, it wasn’t hard to invest in an album by the late Clement Sauve and a great hardcover book on the career and artwork of Jordi Bernet. Bernet even signed the book for me and drew this great little Torpedo sketch on the inside front cover. Combine that with the absolutely gorgeous Dave Stevens sketchbook that I’d already paid for and had to pick up from the IDW booth, and I had this phase of the game on lock. 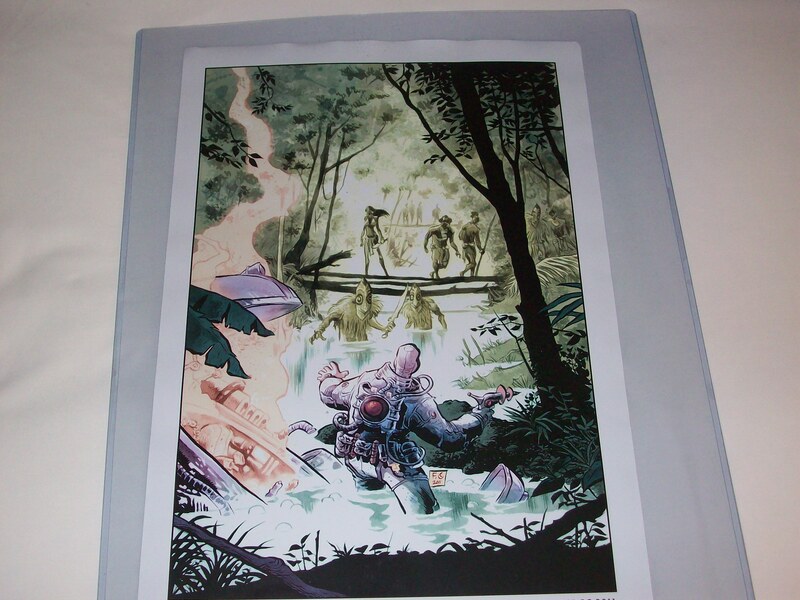 What made it undeniable was the final piece, an oversized slipcased hardcover art book by Steve Rude. Published by Flesk Publications (situated directly across from Stuart Ng Books) I stumbled into this one really, but bottom line, I nabbed a book that retailed for 60 bucks for only 20. Con special, you see, and what put me comfortably over the top. And was the true impetus for mailing things home because while it was a tremendous find, it’s big and it’s heavy. Some of that weight can also be attributed to Kagan McLeod’s Infinite Kung-Fu, a book that I profiled way back in 2002 (I think) in a fairly early Ambidextrous column. That one was almost 500 pages and made the Miranda hardcover look slim by comparison. Top Shelf put that out and Nate Powell was also at the publisher’s table, so having heard great things about him and his work, I bought both Swallow Me Whole and his newer Any Empire graphic novel. Can’t wait to dive into those and the last thing I got from the Top Shelf booth was Kagan’s magnificent History of Rap print which covers about everyone from Cab Calloway to Lupe Fiasco. Thought this was a completely new thing but apparently its been in circulation for a couple years now and I’m just late to the game. 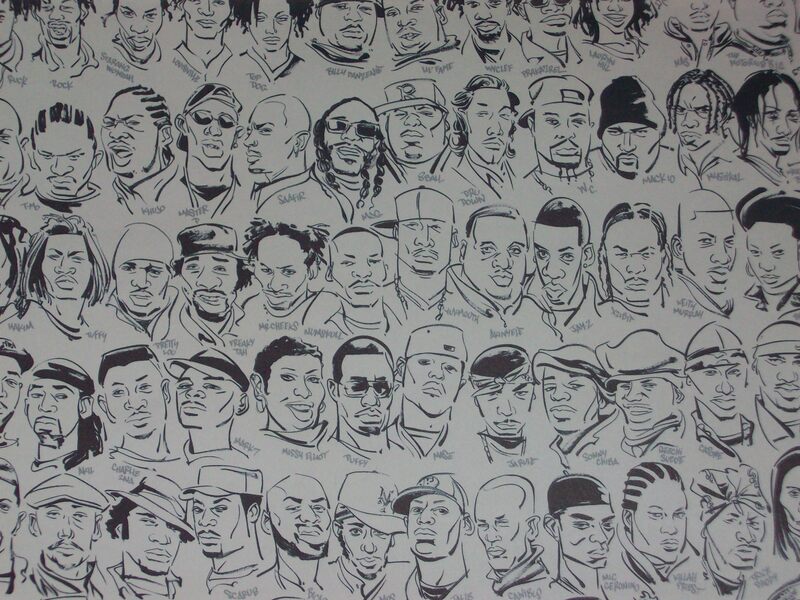 In any case, it’s an incredibly well researched and executed chronicle of the long and deep history of hip-hop in its many evolving forms. 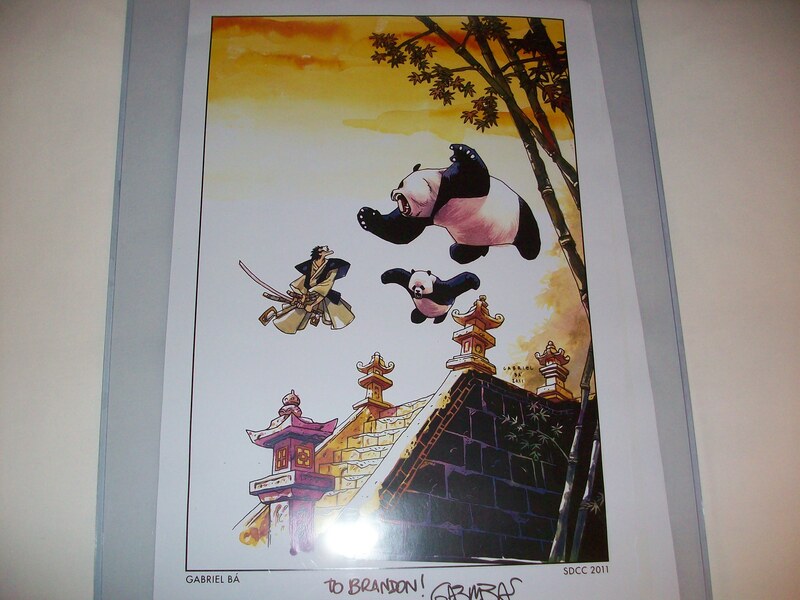 And it deserves a nice frame some day. 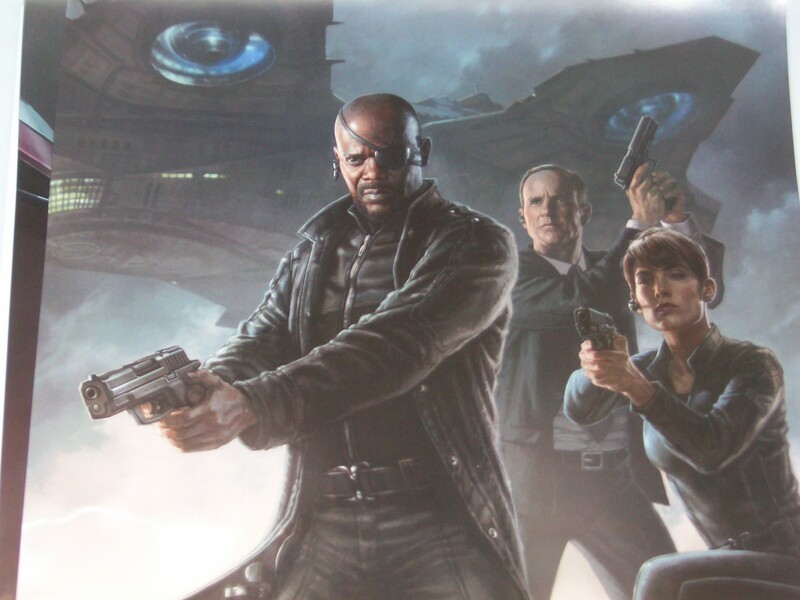 Last couple days weren’t too active on con exclusives and sketchbooks, though it was in regards to 50-60% trades, but I did snag prints/posters from Gabriel Ba and Fabio Moon, Jim Calafiore, and the Avengers poster with Fury, Maria Hill, and Agent Coulson. Not a bad run by any means and I feel pretty satisfied by this year’s haul. Now I only have to figure out the best way to pack everything up for the trip home and wrap up the finale of these con focused articles with the big one—exactly how it felt and what I thought it meant to finally be signing Miranda Mercury hardcovers after all this time.